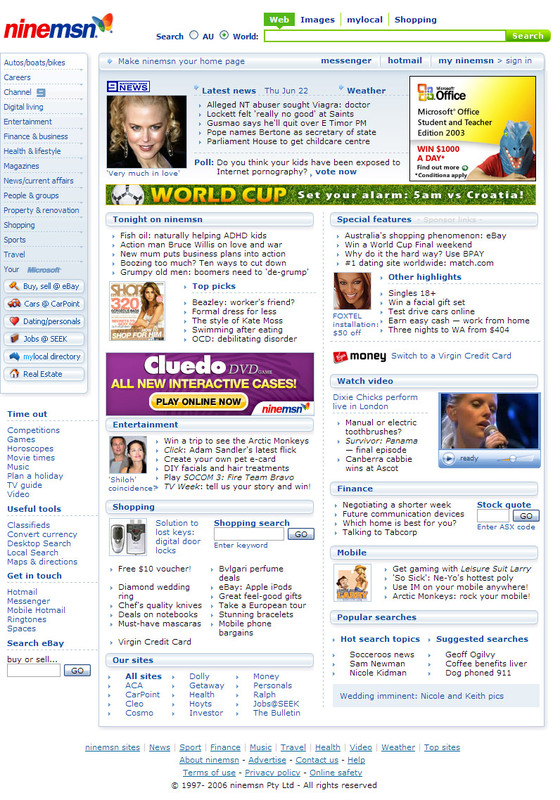 ninemsn, is an Australian internet portal. Formed in 1997 costing $50 million as a joint venture between MSN, the ‘internet services’ provider by Microsoft and Publishing and Broadcasting Limited, the parent media company of Channel Nine, a leading television network in Australia founded by the late Kerry Packer. It hurts me to know that 7.69 million people visit the website each month looking really really hard for news, information and services. This is what it looked like in 2003. This is what it looked like in 2005. I’ve always wondered how much content there is on the front page. So I took the liberty of highlighting the stuff that wasn’t content, which was easier than finding what was. 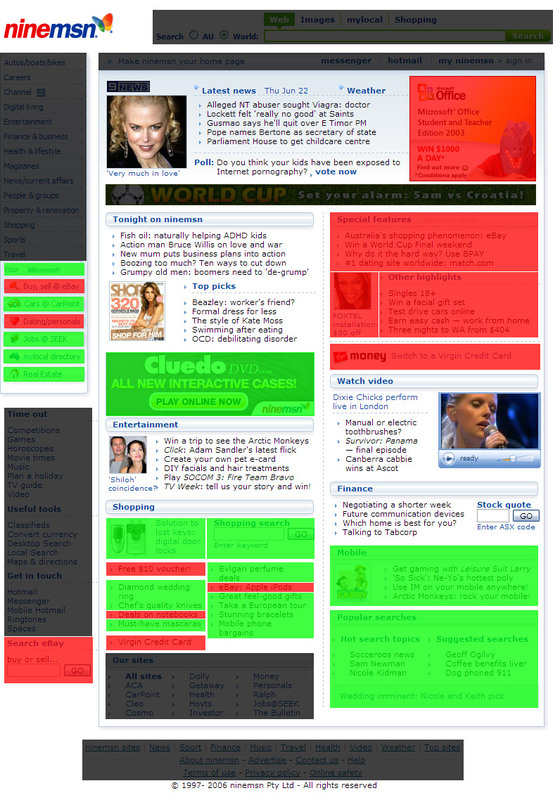 The red highlights external advertisements. The green highlights internal advertisements or affiliated marketing, such as rebranded services. The gray highlights links to other pages, which I don’t consider ‘content’. And this is pretty much what’s left. Wait until you see some of the content pages. Take PC User for example. Styles are all over the place and ads everywhere. I really find it hard to believe anyone would still visit. However I don’t blame ninemsn. Other portals such as Yahoo7 are guilty as well. Portals are large projects to manage. There’s content everywhere, people everywhere, brands everywhere and advertisements everywhere. Maybe Web 2.0 portals got it right. Let the user choose their own content and style. And screw advertisements. Services like Google Personalised Homepage and Windows Live (which I recommend) is quickly becoming widely adopted in the general public. I hope this will pressure Web 1.0 portals such as ninemsn and Yahoo7 to rethink their advertising-centric model. Although to be honest, I really don’t know how Web 2.0 portals make money. Please ninemsn, rethink your strategy. Because sooner or later, the 7.69 million users will figure out how to change the default homepage. Nice work again Long! I refused to follow the crowd and move to Google initially (I was loyal to Excite) but finally did it and loved it ever since. They’re start page just can’t be beaten. Right now though, I’m using Google Reader as my start page. Some people might be saying Google’s starting to be evil, but if they’re giving me what I want. I don’t give a damn (unless they start a military invasion on Australia of course). I agree. ninemsn is an awful website with barely any consistency over the various sections of the site. Their online news reporting is, also, often hours if not days behind other online news services. People should seriously consider Windows Live or make their own page with a bunch of their favourite links on it or something. I didn’t think people still used ninemsn, and for those who do i really feel for you. P.S Go the Socceroos. Betcha that news took hours to make ninemsn too! i want ninemsn home page but it just wont work it says the page can not be displayed! How the …. do I get rid of it from IE7? i am having great difficulty with google. enough is enough. if you have a duplicat comment it did not come from me. if you feel like making accusations of that nature i might as well stay where i am. I cant get into your page.whycant you make it ease ? Not happy now trying to log into my email account, wish you had just left it alone.